Snow was hard to find, but the snowmobiles rode on in Newport at the 43rd annual Dysart’s Snowmobile Ride-in to benefit Pine Tree Camp. 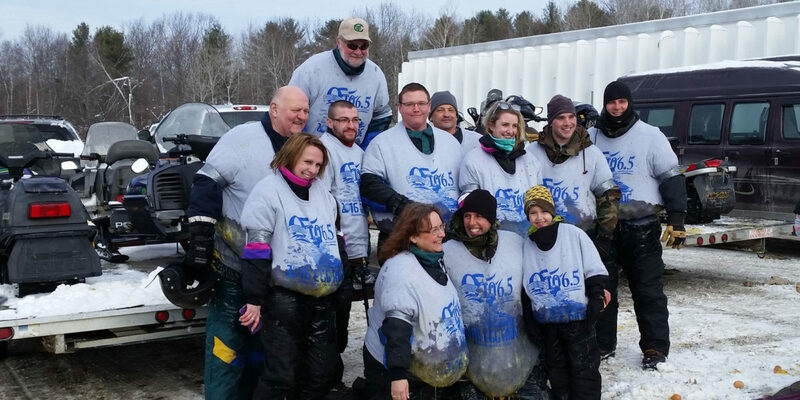 The lack of snow was a challenge, but everyone came together to make it work and, thanks to Dysart’s and Q106.5, a spectacle of hundreds of snowmobiles and celebrity riders rode in on a parade of trailers. The riders continued the tradition of stuffing raw eggs down their snowmobile suits before hopping on the flatbeds. Each egg represented a $50 pledge from Q106.5 listeners and a total of $30,600 in pledges was raised by the Q106.5 Egg Ride for Pine Tree Camp; exceeding the $30,000 goal. All proceeds from the Dysart’s Snowmobile Ride-in directly support Pine Tree Camp’s Campership Fund. The top individual fundraiser was Wesley Daly. This 23-year- old Belgrade resident has been a Pine Tree camper since he was eight and he has participated in the Ride-in nearly every year since then. He not only loves the outdoors and coming to Pine Tree Camp in the summer, he loves winter activities too. He’s an avid snowmobiler and also skis and ice fishes. This year, he raised $4,100. Pine Tree Camp has made a big difference in his life and he’s learned a lot about himself through his experiences there. He works hard to raise money for other campers to be able to attend because it’s his way of giving back. Following the Ride-in, the Dead River Company North Woods Law Meet and Greet took place at Newport Elementary School which drew fans from far and wide. The next big fundraiser for the Campership Fund is the Paddle for Pine Tree Camp on Saturday, June 4. Volunteers and paddlers can get involved by visiting pinetreesociety.org.